In a recent project in which I participated, one of the main metrics the user wanted to visualize involved mode values. I will write about some of the complexities we encountered while implementing it, but before diving into it let’s remember what a mode value is. In the above example, we can see that the value which appears the most is the number 3, with a total of three instances. Now comes the tricky part. Given the following dataset, which value would the Mode() function return? We now have two values which occur the most (numbers 5 and 3), both with equal number of instances. This dataset is called a bimodal dataset, since there are two mode values. The problem resides in the fact that the Mode() function will return null whenever there is more than one mode value. Our user required QlikView to handle these instances differently: returning the lowest of the mode values. So, in the above bimodal dataset, we would return the number 3. To approach this, we discarded the Mode() function and built our own modified mode expression. Once our expression was created and properly tested, we stored it into a variable with parameters to make it more versatile and serve as if it were an actual function, with the ability to call it from different charts. I will now explain in more detail how we achieved this. To illustrate, suppose we are working with the dataset of a University, containing the different Grades obtained by the students across several courses. The steps required to calculate the mode value are: first, we obtain the frequency of each Grade value in the dataset. Then, we pick the one that occurred the most. If there is more than one highest-frequency value, we pick the lowest of those values. As you can see, the two mode values are 100 and 90, each occurring 201 times. The second step would be to pick the lowest value. Since 90 is lower than 100, our modified mode function should return 90. Calculate the maximum number of occurrences that any Grade value has in the dataset. This is done using Max(Total Aggr(Count(Grade), Grade)). The result of this part of the expression would be 201 in the above example. 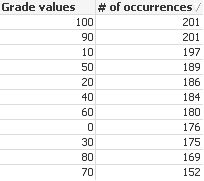 Note this is not calculating the max Grade value (first column), but the maximum number of occurrences (second column) a single Grade value has. To the list of values resulting from the Aggr() function, we apply the Min() function and obtain the lowest of them, which in the above example is 90. Now, we’ve covered the basics behind the modified mode expression, but that’s not the final solution. In order for us to accurately use the Aggr() function inside a Chart, we need to take into account the dimensions used in the chart. For example, we’ve seen that the most frequent Grades occurring in our entire dataset are 100 and 90. But maybe we want to visualize the most frequent Grade by Class, or by Semester, or by Professor. In that case we’d need to obtain a different “max occurrences” value for each subset of the data (for each Class, for instance), and then compare each individual Grade value within that subset to its corresponding subtotal. 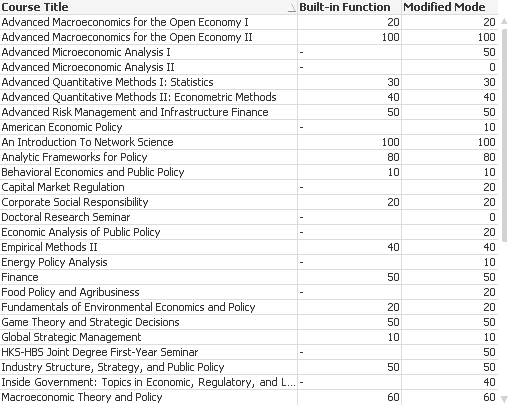 We have added the [Course Title] field to the Total qualifier to produce a different “subtotal” for each course. Additionally, the [Course Title] field was added as a second dimension field in both Aggr() functions used in our expression. The advantage is clear: while the built-in function returns null for some courses (bimodal subsets), our new expression returns the lowest of the mode values. Similarly, our chart could contain more than one dimension at the same time. We should add all dimensions used in the chart to the Total qualifier, as well as to the two Aggr() functions. Otherwise, our results would be inaccurate. Once our expression has been built, and after we’ve identified the different scenarios in which it could be used (i.e. No dimensions, 1 dimension, 2, etc), we can store it as a variable and add some parameters to make it re-usable regardless of the number of dimensions used, or the name of those dimensions. This approach will also help us manage our expressions centrally. In the above expression, the Pick() function houses three separate expressions: one to be used in one-dimension charts, another for two-dimension charts, and another for three-dimension charts (we could easily add more expressions for additional scenarios). This arrangement will help us dynamically select a different expression depending on where the variable is being called from, by using the first of the parameters ($1). If we have only one dimension, then we pass 1 as the first parameter and the first of the listed expressions will be used and so on. Additionally, each of the listed expressions expects the corresponding fields across which the aggregation should be made. This is specified with the remaining parameters ($2, $3, $4). [Course Title], which is the name of our second dimension. Finally, there are some considerations we have to take into account when using this approach, let’s discuss some of them. When using this approach, we must take into account the fact that, since it is not a built-in function, it might not perform as optimal as we’d expect. There are several steps the computation has to take to arrive at the final result. However, when implementing this with our customer, we were able to see that response times were still acceptable in a ~100-million rows app. In the end, we decided to implement a mechanism to allow the user to select if he wanted to consider the multimodal nature of the dataset in the calculation or only use the “natural”, built-in function. This made sense as there were only a few, rare instances in which the dataset became multi-modal. Another way of approaching this could have been to pre-calculate everything at script run, and use simple aggregations in the front end. However, we discarded this option as it would mean to limit the functionality of the app. By calculating the result in the front end, we allowed the user to filter the data in whichever way he decided, with no restrictions, and the result will always consider those selections. At the end of the day, that’s one of the advantages of QlikView: ad-hoc querying and no need for pre-aggregates. The example I have described uses the Min() function to retrieve the lowest of the mode values (when there is more than one). However, the expression could easily be extended to use different operations: Min, Max, Avg, etc. This could be implemented using an island table, for example, but since this has been a long post, I will leave that up to you to explore. 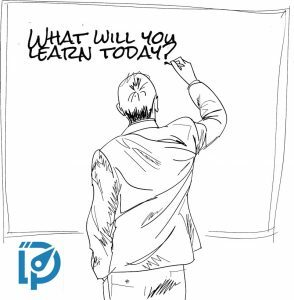 If you would like to explore this approach first-hand, you can download the example app by clicking here. To know more about expression variables, the use of variable parameters and advanced expressions, be sure to check out our book: QlikView 11 for Developers. I have worked with Qlik tools for 10+ years and implemented BI solutions at multiple customers across a variety of industries. I’m author of the book QlikView 11 for Developers (several editions) and blogger at AfterSync (previously iQlik). I'm also the author of the Lean Data Processing online course, focused on building optimized data pipelines in QlikView and Qlik Sense. Thanks! I also wonder if there is some way of doing multi mode for a data set with a average approach for fractions. For instance if you have the the data set of (3.1, 3.2, 3.3, 12.5, 12.6, 12.7) there are two clearly noticeable peaks around 3 and 12. The average of each peak is 3.2 and 12.6. But how to automatically calculate for large dynamic data set? And the method will probably need some kind of threshold for minimum and maximum fractional multi modes to find. From what you mention, this would probably be solved by adding a new field to the data model from the script. For instance, if you have the field “Value (fraction)”, then you can create a new one called “Value (rounded)” which will associate several fractional values to a single “grouping” value. Then, in your expression, you can use Aggr(), as shown in the example of this post, using the new grouping value as dimension and applying the Avg() to the fractional values corresponding to each grouping value. Probably a complex operation to describe, but hope you get the idea. Good luck with it and thanks for leaving your comment. Thanks for your reply and ideas. The closest thing I’ve come across is moving average, http://en.wikipedia.org/wiki/Moving_average. But ideally there is some other formula for large set of values (not in a x-y graph system) where the areas of interest are selected with a radius proportionally to the data spread. Interested in learning how to optimize reloads in QlikView and Qlik Sense? Learn various techniques for tackling big data challenges in Qlik in the Lean Data Processing Master Class. Join here.